Rescuers are searching for around 300 people after a dam collapse at a mine in southeast Brazil left at least 34 dead. The local governor has said the "odds are minimal" that the missing people would be found alive. Seven bodies were recovered hours after the disaster, but the official death toll has risen to 34 this evening, with "nearly 300 people missing," firefighters said. The Minas Gerais state fire department also said 23 people have been hospitalised. 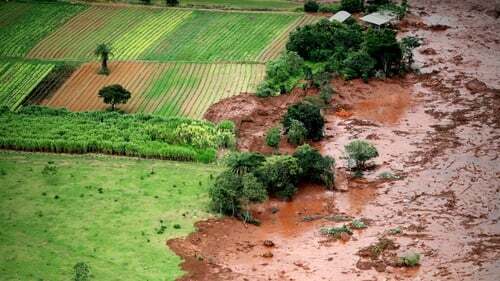 The collapse saw a torrent of mud break through the disused dam at the iron-ore mine owned by Vale SA close to the city of Belo Horizonte, in the state of Minas Gerias, yesterday. The mine is owned by Vale, a Brazilian mining giant that was involved in a previous mine collapse in 2015 in the same state that claimed 19 lives, and is regarded as the country's worst-ever environmental disaster. Vale shares plummeted on the new accident, losing 8% in New York trading. The massive, muddy flow from the collapse barreled towards the nearby town of Brumadinho, which has a population of 39,000, but did not hit it directly. Television images showed people being pulled out of waist-high mud into rescue helicopters, dozens of which were in use by late yesterday because of the cut-off land access. Mr Bolsonaro and his defense minister were scheduled to fly over the zone today. His environment minister raced to the area late yesterday.